Reha Erdem’s film Times and Winds seems to have taken an age to reach the UK since its win at the Istanbul International Film Festival back in 2006, but it has been well worth the wait: I doubt there will be a more elegant, subtle, quietly moving film released this year. The setting or time is not explicitly defined, but we are clearly in a small Turkish village on the mountainous terrain overlooking the vast expanse of sea, a vista given the full widescreen treatment beautifully by cinematographer Florent Herry. The people are simple farming folk, and as such their lives are governed by the rhythm of the natural elements: the weather, and the coming of night and day. The film is structured with another rhythm at its core: the five calls to Islamic prayer during the day (as the original Turkish title, Beş Vakit, describes). As the film opens, the local muezzin is unable to make the call, so his son Ömer is called upon to rouse another man to climb the town’s central minaret instead. It is through the eyes of the village’s children that we see most of what goes on, and it is one of the film’s great strengths that is is neither overly sentimental nor melodramatic in showing the joys and agonies of their lives. Ömer intensely dislikes his abusive father, whose frequent beatings lead him secretly to wish to kill him. Ömer’s friend Yakup is a little happier, and has a rather infantile crush on their pretty teacher at school, whom he is constantly attending to. A girl, Yildiz, is quiet and studious, but has to contend with looking after her small brother. Through these three, still with everything to learn about life, we too learn much about their location and its way of life there. Though there are brief glimpses of the modern world beginning to seep in – a man brings an electronic camera, whose flash makes a young boy think he’s seeing ‘angels’, the minaret has been equipped with PA speakers, whose wires snake up one of its sides – their lives are still primarily agrarian, and inevitably there is the expectation on their parents’ parts that they will learn the skills to carry this on. But being young, they are inevitably rebellious, and curious as to what else there is out there, beyond the sea which seems to stretch away for eternity. Amidst the quiet dramas of the children’s lives, we see life going on around them: human births and deaths, animals born, slaughtered and occasionally procreating – much to the amusement of the young kids – and the sun and the rain attending to the lush scenery surrounding the village. A great sense of place develops very quickly, in large part thanks to Erdem’s long, flowing tracking shots, following people around the uneven streets, and up and down the rocky peaks outside of the village. There is a very interesting use of orchestration in the score – for such an austere piece, one would expect a more languid use of music, but composer Arvo Pärt opts for a more dramatic tone, lending a sense of urgency and drama to proceedings. At times it seemed counter-intuitive, but go with it: it works. For all of the film’s realism, there is also a mystery element, one that it is difficult to decipher. At times the narrative stops, pauses, and slowly lingers over an overhead shot of one or more of the child protagonists lying prone on the ground. Are they asleep, resting in the hot Turkish afternoon? Or something more metaphorical or even catastrophic? This certainly adds a mysterious air to the tone of the film, perhaps also allowing a little breathing-space from the main stories. One point of fascination for me was not in the non-diegetic sounds, but in the copious number of songs and poems being recited by the children; nationalistic ones at school, pledging allegiance to Turkey, as well as more naturalistic ones, reflecting the theme of nature and season; an interesting contrast to the Muslim prayers and calls also peppered througout. While at times nature seems in harmony with religion, there are times when they seem grossly incompatible – in particular underlined by the prayer lines uttered about the sanctity of the paternal figure, in stark contrast to the unsympathetic, unworthy fathers portrayed onscreen. A blend of East and West, secularism and Islamism, Turkey is a country of contrasts, which its increasingly high-profile cinema output is continuing to address. 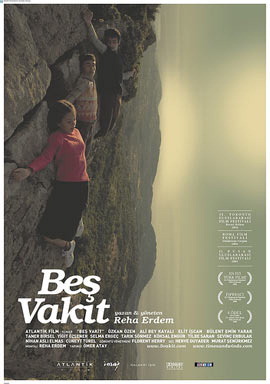 Reha Erdem has made a great film about his country, with all of its contradictions and joys, and also a film full of the simple joys and pains of all of our childhoods. Simply wonderful, and quite probably the best film of the year. A few days after watching the film, I have finally realised what it reminded me of, though in a roundabout way: Federico Fellini’s ‘Amarcord’ (1973). The great Italian film whisks you away to a small town, showing the lives of those present through the eyes of youngsters, as does Times and Winds. And there is the same sense of melancholy at the end of both films, the sense of leaving a place and a time behind.